I've just spent an fascinating hour browsing your website. It's amazing how many highly credible sightings there have been down the years. I went to your site to try to ascertain whether or not I have a piece of genuine 'big cat' evidence, though nothing like what I have showed up. There may be a good reason for this i.e. it's not cat-related, but I hope you can help. I have attached a picture of a what I believe may be part of a claw, shed naturally during scratching by a big cat. I picked it up years ago while out walking in western Argyll, on a private island where I was working. I was curious as to what it might be, so held on to it, but gave it little thought until this evening when my husband, looking for paperclips, came across it in a little dish that sits on my desk, and he asked what it was. I admitted that I didn't really know, and he ventured the opinion that it was not unlike the husks of claws that we are constantly finding around the house, left behind by our domestic moggie, though considerably larger. As can hopefully be seen from the picture, it it a little over an inch in length (that's a one pound cound beside it), and it is hollow. The island where I found it, Eriska, is roughly 300 acres, and is privately owned, with only a 17-room hotel and various staff accommodation. (http://www.eriska-hotel.co.uk/island/index.html) Much of the island is wild, and indeed supports an impressive collection of wildlife for such a small area: badgers, otters and roe deer are all regularly seen, plus lots of rabbits. Eriska is attached to the mainland by means of a vehicle bridge, and one can easily walk across at low tide without getting your uppers wet. I would be most interested to hear your expert opinion on this little find. This probably is the claw of some sort of cat, but it would not be typical of any residual claw sharpening. In those situations, only very small fragments or particles are left on the outside of trees. This sort of loss would more likely be the result of an accident and the lost claw would not re-grow. Both owls and hawks have similar talons, but I'm not certain how they're shed. I had a look. I had expected another crab pincer but not so it seems. I thought it was a bit blunt for a cat claw. If it is cat it looks to be broken off at the base rather than a shed fragment typically seen on or around the base of scratching posts where small fragments or half sheaths are typically found. Crab - I'd be very surprised. Owl/Bird of Prey - Would expect the base to be more slender and the point much sharper. Badger - Not far off, but not quite right. Dog - A little too sharp and slender for a dog's nail, but not impossible considering the variety of dogs available. Cat - Pretty close I guess, although I'd like to see a little more curve on the claw, and a sharper point. Fox - Quite a good match, though the claw is very light in colour, possibly a young fox. I'm thinking maybe cat or maybe fox. Will do a little research before committing. This is certainly a most fascinating find. The two questions which we have to ask, is firstly, is this claw from a non-native cat, and secondly, how did it come to be found on Eriska? The question which immediately springs to mind is how would an exotic cat get onto an island? It is generally accepted that the Scottish wildcat once roamed throughout most of Scotland, (and indeed the UK), but that it never colonised the Scottish islands. Yet we have had several reports of sightings of non-native cats from islands, in particular from Mull. We must be cautious as even if it is a genuine cat claw, it does not necessarily prove that there was an exotic cat living on the island. When visiting Eilean Donan Castle last year I was fascinated to see a tiger claw in a glass case. I forget the exact explanation but I think it was found during renovation of the grounds. One possibility is that this tiger claw had been part of a tiger skin rug which was later discarded. We might propose a similar theory for the Eriska claw. Other examples of out of place evidence for large cat were three large cats skulls which were found in the south east of England. All three were believed to have come from rugs or mounted trophies. I have recently been contacted by a witness in the USA who has also found the skull of a leopard. The origin of this skull, is at present, unknown. In relation to the Eriska claw, several points need to be considered. The fact is the island is rather small, with limited access. The only real human impact in the area is a Hotel for tourists. The question of a viable population on such an area, in relation to large cats, is nonsense. The claw IS large, c.1" in overall length. The claw is laterally compressed, that is to say , albeit hollow, the cavity is rather eliptical in outline. 2) Badgers - The taxiderm/skeletal tissues I have suggest not. Well it is true the forefeet (for digging) have long claws, the curvature of the claws are much more shallower, and the whole ventral aspect of the claw is 'open', not closed/fused. As with foxes, dogs,etc the cavity for the `quick' is more rounded, cf. the flattened cavity of the Eriska claw. The colour seems wrong also. The largest male badger skeleton I have, had a head-tail length of 30" - and the maximum length of claws just approaches 1". 3) Domestic dogs - Generally, with the exception of fore and hind "dew-claws", the cavities assoc with the `quick' are more rounded than with cats. Dewclaws are a possibility, but as stated previously, by Ben Willis, the claw would represent a traumatic episode, with much discomfort and potential blood loss. Cats typically keep their claws in a very sharpened state, as a weapon in attack. The Eriska claw is very rounded and worn at the tip. Whilst I am cofident the claw is indeed feline in nature, I don't believe it to be from a living animal. The reason for the wear on the claw?, likley due to it being taken from a rug mount, be it wall or floor mounted, where the wearing away of the keratin of the nail would not take long. Of interest, is the fact the only real property on the isle, is a tourist Hotel. If it is an old Hotel, ie Victorian period onwards (the hey-day for taxidermy), then I'm sure taxiderm specimens existed there. Whilst I'm not suggesting the hotel is to blame, I believe the claw to have been placed on the isle to confuse its' eventual finder. Was the claw rather conspicuous when discovered?? Aron made a rather convincing case for this theory when he compared the claw to that of a wall mounted rug! The relevance of the area (where claw was found) being 'an island' is somewhat irrelevant, as the island is attached to the mainland by a short bridge! Interesting info from Aron, though I feel he has rather over-estimated the hotel's impact on the island's character, so I'll fill in a little more detail. The hotel itself is indeed a Victorian building, built in the mid-1880's as a private family home, as was used as a summer residence from April/May to September/August each year. It lay more or less untouched since the 1930's when the orginal owners, the Clark-Hutchisons of Edinburgh, sold it on. As a hotel, it has only 17 bedrooms, so even at its busiest time, there are rarely more than 30 to 35 guests staying. In addition, the greater majority of the guests were of retiral age or older, and few ventured past the gardens or croquet lawn! 'Treasure hunts' were just not part of Eriska's make-up. This gentle 'house in the country' feel was exactly what the owners were looking to create, and had successfully traded upon it since they had bought the island and renovated the house (which was then derelict) in 1974. There are gardens around the hotel itself, on the western side of the island, the total coverage about 5 acres: the big house, stable block (which was used for staff accommodation when I was there), lawns, vegetable garden, car park and tennis courts. There are a few fields on the top of the island, and a few more in the south west corner, along with a peat bog or two, but the rest of the island (around 350 acres) is very much 'as nature intended', largely untouched, with some parts positively 'jungly'. The owners were against setting up recognisable trails around the island, as they felt that its wildness was very much part of its appeal. I understand that it's slightly more accessible now, but this was not the case in the mid-80's. The area where I found the claw was the north eastern side, a good 25 to 30 minutes walk from the main area of the hotel, and a similar distance from the area where at very low tide, one can walk from the mainland across to the island. I can honestly say that in all the times I'd retreat there to read and sunbathe, I saw no other people, only birds, seals and roe deer. The point itself was at the head of the beach, in a grassy area just before the trees, in among other pieces of detritus (twigs, leaves etc). It's entirely possible that one of the Clark-Hutchison children may have had a taxidermy claw from an old rug as a plaything. However, I wouldn't have thought that it would have been hollow, nor so fragile. I think Aron is being a little harsh to suggest that it is 'nonsense' that the area would not be able to sustain a big cat or two: it's a very under-populated part of Scotland, and with the amount of sheep, cattle, roe deer and red deer on and around the island, I think there could easily be a living to be had for a big cat, though whether there ever was one there is a moot point. Interestingly, the herd of roe deer on the island were visited regularly by an itinerant stag, who was sometimes seen swimming across from the mainland at the top end of the island! So wildlife on Eriska is not as marooned as he thinks. As always, interested to hear any feedback. The point of writing my opinions was to state as far as the photograph allows, the claw represents a FELID, and certainly NOT a badger, fox, unlikely dog, etc. My background, I'm very much the amateur naturalist, and vet by trade. I do taxidermy as a hobby, and have lots of specimens of local wildlife currently stuffed, and have a freezer currently full to the lid with more specimens. I have 2 foxes stuffed/mounted, and have antique victorian wildcat and also a female subadult Snow Leopard skin. The claw from the isle, as far as can be seen from the photograph, is of comparable size. Incidently have lots of skeletal material, inc badger skeleton, lots of skulls, etc. 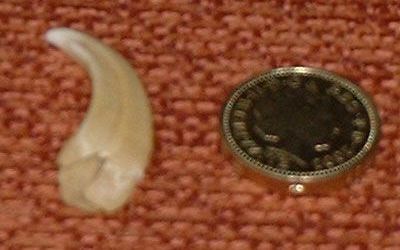 The curvature of the claw and the lateral compression of the claw all point to a FELID, not other British wildlife as was speculated previous. To see so much of the claw would indicate it wasn't as a result of flaking keratin from sharpening, but the claw has been traumatically removed. The degree of wear, as seen in my own rug mounts, of the keratin suggested to me a possible taxiderm specimen. Often, whenever we comment on a photo, the given circumstances will influence the opinion. I had said I believed the claw to probably be the dew-claw of a dog, however based on the photo alone, it does appear more feline-like. A taxidermy mount may explain how it ended up in the place it was found. I know the place from when I lived in Argyll and agree it is not really that cut off as far as wildlife goes. I remember a friend telling me that the guests were able to feed badgers that visited the hotel during dining hours. Could it be a badger claw? Aron? I was very lucky, many years ago to come across a near complete badger skeleton at side of country road, clearly a road casualty. The specimen was an adult, very aged, male. Very large. Apart from the tail vertebrae, and some of the smaller toe bones, a near complete specimen was obtained by digging. Re the badgers claws, and comparisons with badgers in my freezer (taxidermy projects for the future) there are obvious differences. Along the lesser curvature, ventral aspect, of the claw, in badgers it is NOT fully fused, indeed, somewhat "open", almost gaping in parts. The curvature of the claws in my huge male, are much more shallower than the Eriska claw. The colour is not quite right, badgers being very dark grey, brown through to black. the Eriska claw appears very palid, something very commomplace amongst felids. The badgers' claws are not as LATERALLY compressed as the Eriska claw appears to be from the photograph. In relation to size, the male skeltal badger is very large, well over 30" long when fleshed in, and yet the claws don't quite reach the size obtained by Eriska claw. While not wishing put put the cat amongst the pigeons (pardon the pun, but it's my job!) is there any chance the claw could be from a Common or Atlantic Grey seal? Both species (I think) have claws of some sort on their front legs (flippers?) and given their common ancestry with felids and canids there may still be some genetic similarity. Interesting comment. Whilst in the process of procuring a seal skull 4 years ago, busily decapitating a rotting carcase on the beach for "fleshing-out" (aah! the things you do when you're gathering natural history specimens!) I remember examining the forefeet of the common seal. I cannot recollect fully the size and curvature of the claws, but if memory serves right, they appeared straighter, with less curvature, and dense, like with round cross-sectioned dog claws. And they appeared very blunt, from wear, stones/sand/rocks/etc. Or at least that's how I recollect them to have been in this specimen. If the claws are in very frequent use, ie dragging along beaches etc, I'd imagine the claws would be more substantial than the Eriska claw. Mo believed the thing to be relatively thin, more akin to relatively little-use-claws of felids, largely in a retracted state until last minute of the killing process. Exmoor the mascat has just provided me with some claw fragments that I've imaged and will post to the photo section. Interesting, these fragments were found on our living room sofa, rather than her usual outdoor scratching-post. This helps to explain why we never find these claw particles in or around trees where wild cats have left their marks. Whenever cats sharpen their claws on trees and stumps, they merely break open the sheaths or coverings over the new claw. Later, during the grooming process, these fragments are torn away by the teeth and left wherever the cat was lying.